Participants in our training courses sometimes say that they want to learn apply progress-focused techniques in a fluent and natural way. They usually add that they want to learn to not have to think so consciously about their questions and responses. They want their conversations to go smoothly and want to feel like they're effortlessly doing the right thing. In response to such questions I sometimes give the example of someone who is watching a competent pianist play a beautiful piece by a wonderful composer, say Chopin. The person is watching the pianist and and enjoys the performance. The performance is fluent and appears effortless. Inspired, the spectator contacts a piano teacher to take lessons. He or she thinks: I want to learn to play like that, too. What a pleasure that must be! Then, the lessons start and the person finds out that playing the piano is not easy. Simple tunes with one hand aren't easy, let alone when the second hand is supposed to join. As can be read in a new book by Edward Singerland, Chinese philosopher Confucius (551–479 BC) already realized that people aren't born with these types of competences. He and other philosophers called this type of seemingly effortless performance wu-wei. 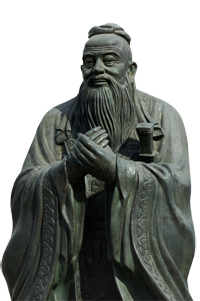 Confucius had observed that people are capable of consciously learning new skills and behaviors which, after many repetitions, can become habits which can be performed relatively effortlessly. Effortless, in the sense that one hardly has to control and monitor oneself while doing the activity. Other philosophers of the time, like Laozi had a different view of wu-wei but that would take too long to explain here. Modern neuroscience has shown that the lateral prefrontal cortex (PFC) is very active when we are acquiring new and complex skills. This lateral PFC activity helps you to concentrate, to not be distracted and to avoid serious mistakes. After many, many hours of practice, the lateral PFC starts to play a smaller and smaller role and a lower brain structure, the basal ganglia, starts to take the lead. If we cannot say where a certain letter is on our keyboard but we can effortlessly find it when typing words, the basal ganglia are doing the job. We do not have conscious control but we do have muscle memory. Our fingers, as it where, know what we do not consciously know. When a complex skill has become automated like this, control from higher brain regions is no longer necessary, at least to a much lesser extent. Executing the activity happens fluently. You hardly have to be conscious of yourself and what you are doing. It seems like your body is doing the work. Moreover, if you start to think too consciously during such an activity things are likely to go wrong. Consciousness thus plays an essential role in learning new skills but can distort performance when the skills has been learned. When you have to perform a complex activity for which you are competent and you have all sorts of conscious thoughts like "I have to do this right! I can't make any mistakes, now! ", you might choke and not perform well. What is needed in such situations, according to Singerland, is that we try not to try too hard. A good performance requires that the lateral PFC does not interfere. The paradox is that you have to try to let things proceed as if by themselves. Conscious and controlled attentions thus plays an important role in learning new skills but can hinder performance once the skill has been learned. What does this mean for learning progress-focused skills? I argue that before conversations we need to think very consciously about our approach and practice it very deliberately. During conversations, we need to let go of that conscious thinking a bit so that we can mainly focus on what our clients are saying. We largely have to trust that all of our practice will pay off and that we will do useful things during the conversation. After the conversation we can go back to the highly conscious mode and reflect deliberately on what happened.